As hard as it is to believe, after 37 weeks and 22 different cheeses, our first full season of milking and cheesemaking for our herd-share has come to a close. What a season it was! Finally, after years of planning and preparation, we started to live our dream of providing local and sustainable food to our community. It has been incredibly fulfilling and we are so thankful for our amazing herd-share members who decided to jump on board and give us a chance. We'll be back at it in May and can't wait! In the meantime, our lady goats are pregnant and taking a little vacation before their due dates at the end of April and we, the farmers, are taking a little break as well! 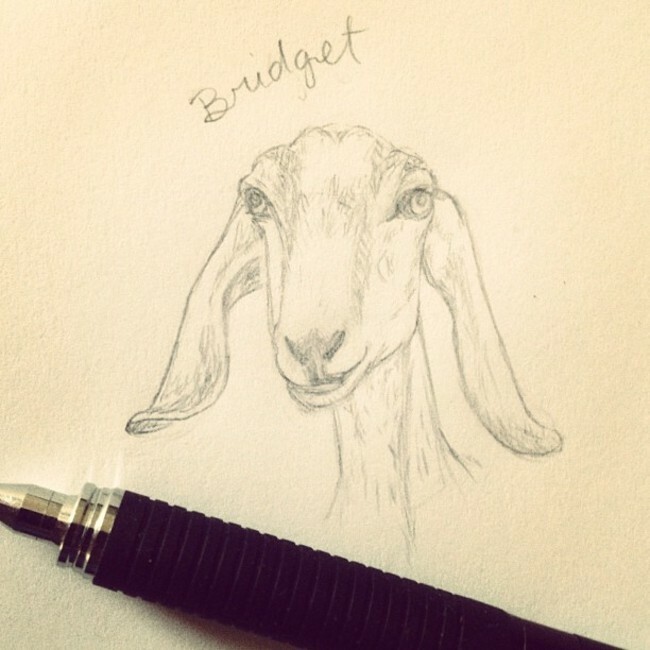 There are still chores to do - everyone needs to be fed, watered, and moved to fresh forage, but our milking routine has slowed from machine milking 6 does twice a day to handmilking one goat (Mayday) once a day (we've been spoiled and can't give up our fresh milk and cheese!). This is giving us a little extra time to take a deep breath and prepare for next season. We'll be expanding our milking herd which means we'll be able to accept new members! If you are interested and would like more information let us know! You can reach us at farmer@littleseedfarm.com. Here's a little (er... well, large) recap of the cheeses our herd-share members enjoyed to tide you over 'til the milk flows again. 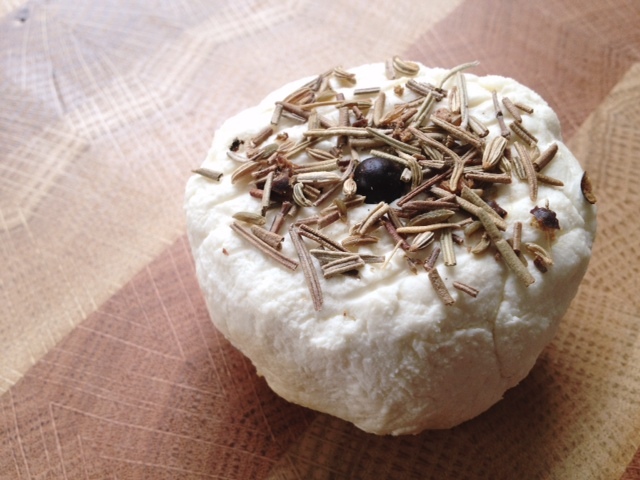 Our raw goat's milk brie style cheese - Calima. Many of you have probably seen photos of our cheese and ramblings about a "cheese herd-share" or a "cheese CSA" on Facebook or Instagram and wondered what was going on. Well, let us fill you in, because it's been a huge leap for us this year and we just realized that we never posted about it on the blog! Last fall our family started helping us with what turned into a pivotal project for the farm: renovating the "old barn" - transforming a dilapidated, brown recluse infested, dairy barn from the 70's into something we could actually use. Over the course of the winter my Step-Dad and Grandpa helped us create a larger space for milking as well as sanitary rooms for handling milk, cleaning equipment, and making cheese. It was a fun and special time that we'll never forget - weeks of family dinners and the satisfaction building something lasting together. A time that deserves it's own blog post! We ended up with a space that exceeded our expectations in every way and has allowed us to make our cheese available to our community - a dream come true. In early May, not really knowing what to expect, we launched a raw milk cheese herd-share where members of the herd-share receive a portion of the herd's milk production as cheese each week. The members are actually co-owners of the goat herd. We have had an overwhelming response and are now delivering cheese to members in West Nashville, Donelson, and Murfreesboro. 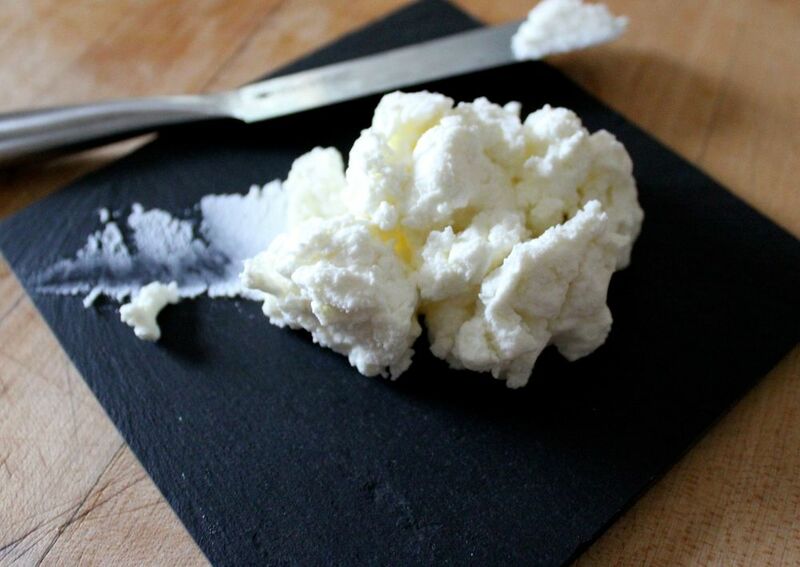 Each week our members get an email telling them what their cheese of the week will be along with recipe ideas, pairings, a little bit about how the cheese was made and its history. Making such a wide variety of cheeses has been exhilarating. I love discovering the cheeses that really bring out the special qualities in our milk and the challenge of finding new ideas feeds my creative nature. Since starting distribution in May we've made everything from more well known cheeses like feta and brie to more exotic offerings like haloumi and crescenza. It has been fun to share the cheese love with our community - my secret wish is to turn our members into certifiable "curd nerds" and I think I may well be making some progress! Skyr, our icelandic style, extra thick yogurt. In addition, the herd-share format makes everything much more personal, which we've really enjoyed. All of our co-goat-owners are amazing people and we've been so lucky to meet such an incredible group of people. It's nice to be more and more a part of the community as we go along and we couldn't ask for a more welcoming bunch! 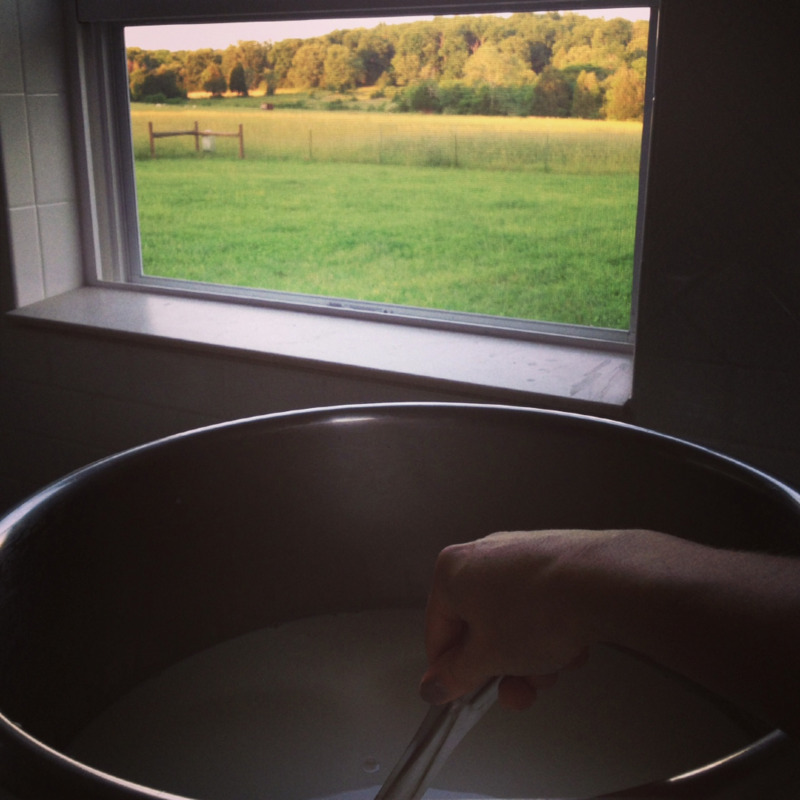 Our plan when we moved to the farm was to start construction on a licensed creamery for making cheese. We postponed those plans as we settled in. It was clear that we needed a full season to focus on growing our herd and continuing to develop our cheesemaking and animal husbandry skills. Given that I was working remotely there wasn’t as much of a rush. A big hurdle has been getting our goats adapted to our grazing system and living in the outdoors again. Goats’ adaptation into our grazing system took longer than originally anticipated. We've found that it takes about 2-4 months before a goat adapts and their milk “gets better”. We judge the goat’s health based on body condition and the quality of their milk (SCC counts, Fecals, FAMACHA, and other stats). It takes 2-4 months for a newly introduced animal to achieve our existing herd’s levels (an attribution to pasturing animals instead of keeping them in a barn). It’s also strangely consistent with their smell. Goats smell different when they live in a barn. It literally takes months before that smell goes away, and it happens to coincide with when the milk gets better too. Anyway, I had been working with this company for the past 4 years. When we first made an offer on the farm last October it seemed that the firm I worked for was going to be in operation for a long time to come. As we moved to the farm the following March the future of my employer came into question. So we delayed investing our life-savings in a licensed creamery. It was a 50/50 proposition that I’d still have a job by the end of 2012. Hanging on to some savings in the event that we were both unemployed turned out to be a smart move.